The problem is that all methods of getting the Windows 10 Start Menu to appear do not work. That is, there is no response when clicking on the Windows taskbar icon, pressing the Windows key, or pressing the CTRL + ESC keys together. To fix this Windows 10 Start Menu problem, I found that for my case, I needed to take the basic solution below and very slightly change the procedure. Bascially, I needed to apply it two times before my Windows 10 Start Menu would display again. The basic solution that follows is one that can be found here and here, among other places, so credit goes to those sources. Note: Any customizations you may have made to the start menu shortcuts and ordering may be lost. 1. 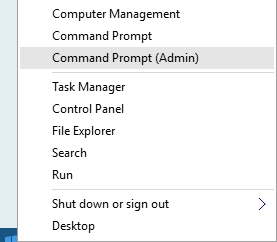 Right-click the Windows 10 Start Menu icon, then select “Command Prompt (Admin)”. 2. In the “Administrator: Command Prompt” window that appears, type in “powershell” then hit Enter. The command prompt will now have a “PS” in front of it. At this stage of the solution, my start menu still wasn’t working. Only after the next step of repeating the command, did my Windows 10 Start Menu start functioning normally again. After running this command a second time, after which no red error messages appeared, the Windows 10 Start Menu now worked and responded normally. This is the solution that worked for me, and hopefully it works for you. 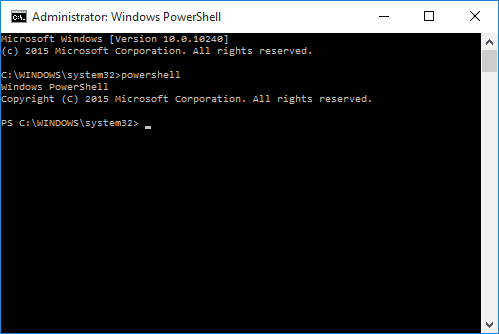 Some users may only need to run this powershell command one time, to fix their start menu. Again, I did not invent this fix, but just found that applying it twice is what worked for me.